If it weren't for my blessedly heated birdbath, I might not even realize that there were bluebirds about. They seem to stay hidden in the woods, where they subsist on buds or bugs buried in bark, and maybe a few withered wild fruits. 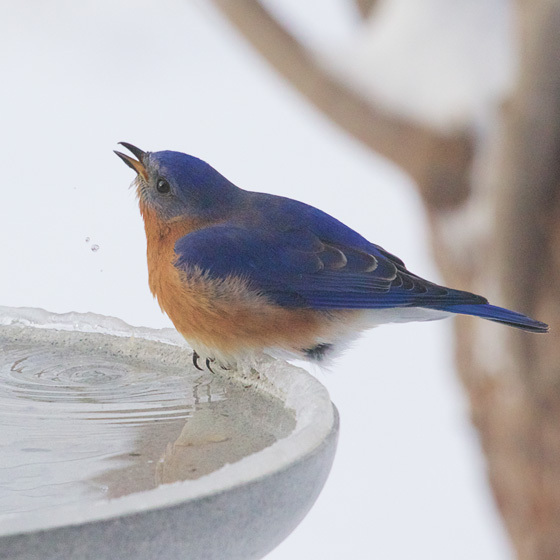 But whenever the stream is solidly frozen over, I can count on seeing Eastern Bluebirds right outside my window. Makes a fine start to a snowy day. Attractive sand coated oasis with concealed heating element keeps water from freezing during winter. Designed to be placed on the ground. Cord tucks away to allow for year-round use. Costs only pennies a day to operate. The Eagle Optics Shrike 8x42 costs under $100.